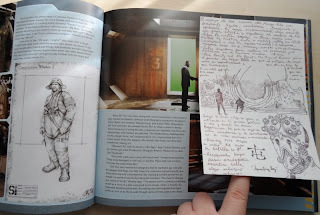 Books that explain the process of creating a particular film don’t usually appeal to me. Maybe on some level I am afraid of seeing the wizard behind the curtain or the strings manipulating the puppets. What went through my mind when I picked up this hefty Pacific Rim book, I just can’t be sure. I think it was largely the desire to find out more about the creatures and creations, and to see a little bit more of the world that was created (and partly destroyed), with the hope that nothing would be “ruined” for me. On first noticing the cover, I was a little put off. I felt it had a childlike quality: the yellow hazard markings akin to something seen on the box of a toy bulldozer for a three year old. The rest of the artwork looked fine, but this just made it look a little cheap. 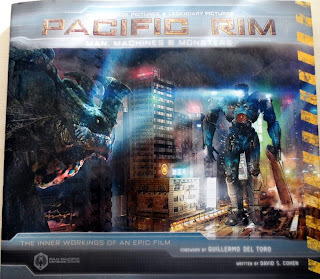 Thinking about it more deeply, Pacific Rim was very much formed from the films that the young Guillermo del Toro watched as a child, so maybe it isn’t such a bad thing. No...it still looks cheap. 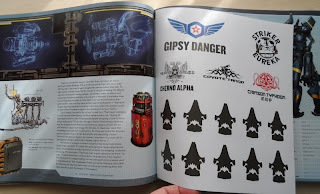 When you open the book for a browse, you will probably find it falling open at the middle pages which have sandwiched between them a small collection of stickers. Yes. Stickers. While nice to have I suppose, they do little to shake my notions above. 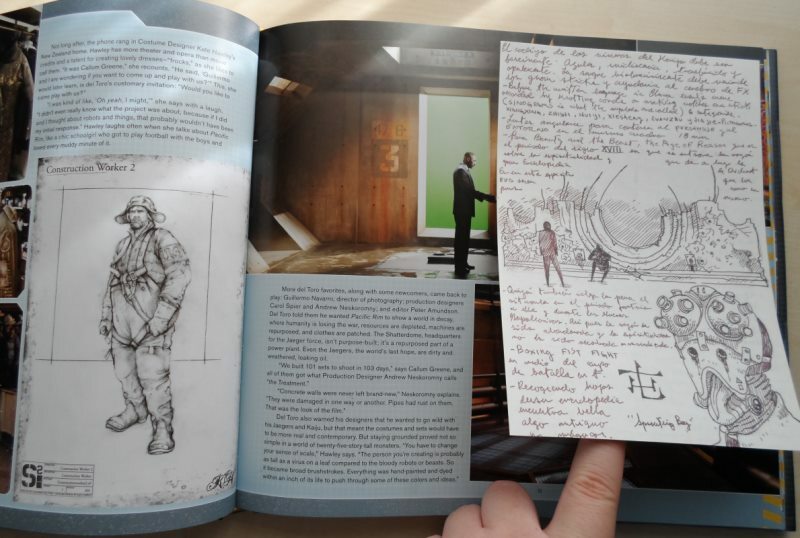 Casually flicking through, you will find other things stuck to the pages, little slips of paper or bits of cardboard. 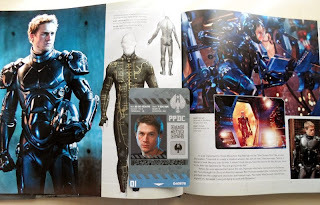 The cardboard is in the form of two I.D badges, which while nicely presented, also add to the childlike air of the book. I’m glad to say that this is where the childish stuff seems to end. Other inserts are in the form of Guillermo del Toro’s notebook pages, and blueprint designs for the various Jaeger machines. These are very nice to look at and are the only things included in the book as a novelty that I genuinely think add any value. The book itself is a great read. 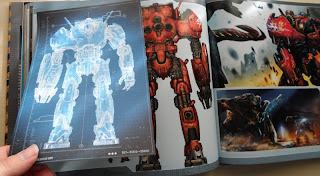 It feels high quality with lots of images and information to digest about the characters, Jaegers, Kaiju and other aspects of the film, with plenty of specs and charts to mull over while having your tipple of choice. 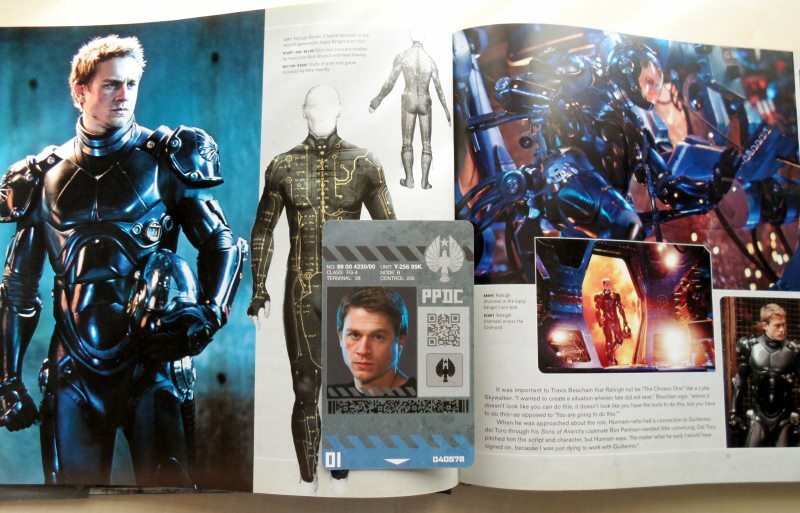 I can’t go into too much detail as that will just devalue the book should you choose to buy it. Just suffice to say that there is a lot of material contained therein. It probably goes without saying that you need to have liked the film to really get anything out of the book. If you were indifferent or disliked the film, I don’t see why you would be even thinking of getting the book anyway. If you enjoyed it, I think you will enjoy the book as well. Even if it’s a book which you just flick through now and then to enjoy the artwork, I think you will get your value from it. The book sells for £29.99 RRP which is what I paid. I don’t feel ripped off, but if you see it for around the £20 mark I think you would have a proper bargain on your hands.